The evolution of youth sports and fitness has come along way since dodge ball in gym class. Exercising at an early age can help our children develop good fitness habits that can last a lifetime. This workout is no substitute for a healthy diet and an active lifestyle. Please consult with your physician before attempting an exercise program. Always supervise a children during exercise and make sure the environment or area is safe from any hazards that may lead to injury. Always warm up and stretch before any exercise. This gets your muscles warmed up for activity. 5-10 minutes, squat thrusts, jumping jacks, mountain climbers, jogging in place. Body weight exercises are best for children. Start with 10 repetitions and gradually increase as your strength improves.I like to implement an active recovery method, which simply means while the upper body rests, we work the lower body and visa-versa. The most Important element of a kids workout is to keep it fun ! If you are smiling with high energy so will they. Constantly give positive reinforcement and guidance. 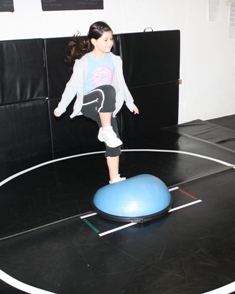 Keep checking back for more advanced youth workouts using light resistance, medicine balls, Bosu and stability balls. To return to from the youth workout page to the Home Page click here.